30 Cool Dollar Store Organizing Ideas Making The Most of your Space with Utmost Style! Home » ORGANIZING IDEAS » 30 Cool Dollar Store Organizing Ideas Making The Most of your Space with Utmost Style! Right from super handy baskets and bins to a large variety of racks, cans and buckets, Dollar Store has got it all to integrate a better organization into the household or workspace. And that too, in a surprisingly budget-friendly deal! Even more amazing is the fact that you can add a dash of creativity to that stuff to end up in storage solutions that are not only purposeful but look absolutely chic and trendy. Here are 30 cool Dollar Store organizing ideas making the most of your space with utmost style. Uber funky is the word for a plastic container that comes adorned with delicate ribbons. A simple plastic container with holes on the sides purchased from the Dollar Store is the building block of this cuteness. Grab a cut ribbon and start from the top of the basket, weaving the ribbon through each hole. Each level of holes is decorated with a different colored ribbon, tying the two ends of the ribbon together in a bow when it reaches the edge of the basket. For a simpler look, you can always go for a long piece of ribbon in a single color. And the best thing about the quick embellishing is that it’s totally mess-free and can be pulled off even by the kiddos. Make sure that all those pends getting all over the place on your desk remain well-organized with a dash of style. All it takes is homemade pen pots constructed using chic tin cans from the Dollar Store that are a fab option for easy storage. The outsides of the cans look oh so splendid with vintage-themed card paper wrapped around the surface with the help of some double-sided tape. Build separate pots for all your brushes, pens, pencils and sketch pens, going for a different yet coordinating print designs on the paper. Not only is it appealing to look at when you place a bunch of pots on the desk, but also super budget-friendly to make. Who said that those cake stands were meant to decorate those delicious treats alone? This convenient kitchen utility has got so much more to itself when it comes to keeping the space organized, while keeping everything surprisingly easy to grab – thanks to the rotating feature of the stands. This kitchen organizer adds a quirky appeal to your kitchen, storing all the wash clothes, dish soap and hand soap at a single spot. A Dollar Store candle holder and metal tray are spray painted with Krylon Oil Rubbed bronze, putting some scotch super glue around the candlestick’s rim. A hugely cute bowl from The Target holds the wash clothes with grace. Apart from the kitchen, you can also employ the stand on the craft desk, or simply in the bathroom cabinet. The amazing storage possibilities that the cost-friendly Dollar Store bins and baskets sport surely doesn’t need any explanations. But, the color scheme of every bin or container might not always suit the decor of your home. What comes to the rescue is this incredible hack shared by Domestically Speaking that will turn the bins into a super stylish storage in just a matter of few steps. Give the bins a lovely industrial aged metal touch using some gray automobile primer, chalkboard paint, silver craft paint, a foam brush and a chip brush. Coat the bins with primer, further applying chalk paint and rubbing it with an old rag. Last comes the shine with silver paint and voila! Make the bookshelf stand out with one-of-a-kind bookends holding the books in place. Even more special is the fact that they are crafted at home – all it takes is plastic animal figurines from the Dollar Store, a couple square wooden pieces, some sand paper, a spray paint in your choice of color, a spray primer, a nice clear gloss sealer, and some wood glue. The teal blue paint on the elephants here is protected with the gloss, having the L-shaped wooden bases hold the animals upright, ending up in a bookend that the kids will surely fall head over heels in love with. Head to the below guide by Love Grows Wild to get a deeper insight into the endearing craft inspiration. The very first glance at a jewelry stand as glorious as this one is going to take your breath away. And the credit not only goes to its beautiful making, but also the distressed vintage paint job it flaunts. Putting the storage solution together from the very scratch is a complete child’s play, and the whole magic here is done by an old candlestick cut into two smaller portions. The shelves of the storage are actually beautiful different-sized aqua dishes and a large bowl that you can find from the Dollar Store for a tiny price. Speaking of the steps, it’s all about gluing the pieces together in a tower design that you like and voila! Keep the candlestick pieces as they are or simply coat them with a matching shade of paint. Pay an awesome tribute to the autumn season with a stunning piece of storage that’s crafted entirely out of faux leaves coming from Dollar Store leaf garlands, having the stems of the leaves removed. This autumn leaf bowl is as functional as it’s beautiful to look at, calling for a handful of other supplies, including some Mod Podge in matte finish, a foam brush, a large balloon, a pair of scissors, and a mixing bowl to get it all done. Once you apply a thin layer of Mod Podge on an inflated balloon, you lay the leaves on the wet layer, sealing them with another layer of thin Mod Podge. Once it’s dry, simply pop the balloon and you end up with a natural-looking bowl. Give an all new purpose to old photo frames, transforming them into a gorgeous multi-tiered tray that provides ample of storage space to keep anything ranging from fruits or snacks to art supplies, from bathroom stuff to makeup products perfectly well-organized. You will need at least two frames of varying sizes, some paint (preferably in a chalky finish), an old wooden pallet, a miter saw, some wood glue, satin poly, a large wooden candlestick and finial to begin with the construction. Wood forms the base, while the frame forms the stylish edges of the shelves, wherein you screw the frames onto the top and bottom of the candlestick. There are all kinds of soap dispensers available out there, but this mason jar transformed into a pretty soap pump is so adorable to look at that no matter if you have already got store-bought dispensers resting on the bathroom counter, you would want to let this one be a definite part of your home decor. The lid of the jar is jazzed up with pretty patterned paper fitted into the tin lid, while a pump extracted from an old lotion jar serves the purpose of the dispenser. You can always buy a pump from the Dollar Store, and assemble everything together using a glue gun. To prevent the lid from rusting, you make a glue seal between the pump and lid. Introducing a light farmhouse touch to your center table, this gorgeous flower caddy is going to be the focal point of the space, while being equally functional in storage. The caddy giving a makeover to a lovely wooden box is coated with an edgy coat of milk paint, adorned with a little vintage label plate on the outside. The basket has got clear mason jars allowing for decorating the room with your favorite flowers. Here, the author uses a distressed paint job for a rustic look, but a vibrant hue would look just as pretty as this one. It won’t be an overstatement to name this as a spring-worthy centerpiece coming like a breath of fresh air. Let this cool hack from the Greco Design Company lay the foundations of some inspiration for your next DIY bathroom organization project using just a matter of few cheap, yet wonderful supplies from the Dollar Store. A rustic white rope hangs the towel with style, having its ends tied in knots around two galvanized clips attached to the bathroom wall. Build dedicated towel holders for each of the family members, using the vertical bathroom space at its best, freeing up a great deal of cabinet room to keep the other essentials. Head to the below tutorial to learn how you can construct the holder from the very scratch, adding a lovely nautical appeal to the space. If you are totally obsessed with storing stuff in cute baskets or working up homemade solutions to keep everything in a well-decorated manner – then you surely are going to have the hots for this pretty wired cart basket from the Dollar Store that gets a glorious makeover in the below inspiration shared by Gail’s Decorative Touch. The author here makes the cutest burlap liner for the basket, turning it into a craft project that compliments just about any home decor. A beautiful graphic printed from The Graphic Fairy onto a coordinating fabric is attached to the front of the basket with twine, and it stores a bunch of pillows and cushions with true charm. Bid farewell to the complete mess that once the yard used to be, having all the toys, balls and random play supplies thrown all over the place. For this do-it-yourself toy storage is here to introduce organization to all the toys, while adding so much more funk to the space. Bright metallic-looking bins from the Dollar Store come handy to build this storage shelf, telling what’s stored in which bucket with the help of cute labels adhered to the front of each bin. Make separate sections for sand toys, cars and trucks, water toys, balls, chalk and bubbles, and more! After all, you surely don’t deserve to struggle every time you try to manage the garden and even end up not finding stuff every now and then! A vintage set of stunning teacups like this one will add unbeatable glort, chicness, and a cherishing luxurious look to your home when resting on the dressing table or the vanity counter. All you need to do is to place the teacups on the desk or inside the jewelry drawer, allowing each of the cups to hold different items, including your necklaces, chains, earrings, bracelets, rings and whatever you can think of. Oh yes, the hack is also going to ensure the pieces don’t get all tangled into each other anymore! Head to the below inspiration by Marcus Design Inc to know more about making the most of the vintage cups, along with some goblets and little dishes adding the perfect accents to the storage. 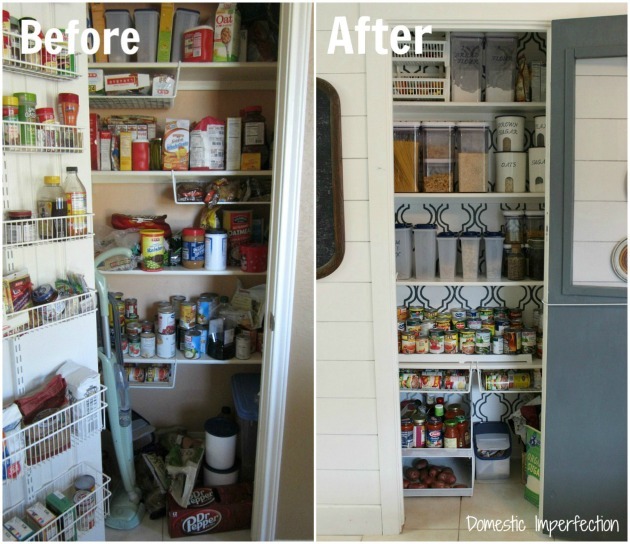 Installing a stunning patterned wallpaper at the back of this pantry is the most amazing part about this makeover! Nothing can make the storage space as well-organized than employing specific shelves for a similar kind of food items. Go for symmetrical storage bottles and jars to keep things in place, dedicating plastic airtight storage bins from the Dollar Store to hold the different cereals on one shelf. Make the most of the available space with wire baskets screwed on one side of the pantry. Larger bins would work just perfect for storing all fruits and vegetables, while the smaller ones store loose condiments, tea bags or small snack packets. 19 Spacious and Stylish Toy Storage Ideas That You and The Kiddos Would Love Equally! 15 Oh So Creative Nursery Organizing Ideas Making the Baby Room Look Even More Beautiful! 20 Hanging Bathroom Storage Ideas Making the Most of the Wall Space! 19 Ultra Innovative Garage Organization Ideas That are Versatile and Super Functional!